Sauté the onion in oil until translucent but not yet browned. Add the rice and stir until the edges of the grains become slightly transparent (about 2 minutes). Add the wine and stir until all the liquid is absorbed. Add the herbs and a ladleful of chicken stock, stirring continuously. Add another ladle of stock but only once the first has been absorbed. Keep adding stock one ladleful at a time until the rice is cooked. This will take about 20 minutes. Add the lemon juice, lemon zest, butter and Parmesan. Turn the heat off, place the lid on the pot and allow the flavours to develop for about two minutes. To make the Hollandaise, heat the butter until piping hot and bubbling. In the meantime, whiz the egg yolk with the lemon juice in a blender. With the machine running, slowly pour the hot butter into the blender until the sauce thickens. Add the black pepper. 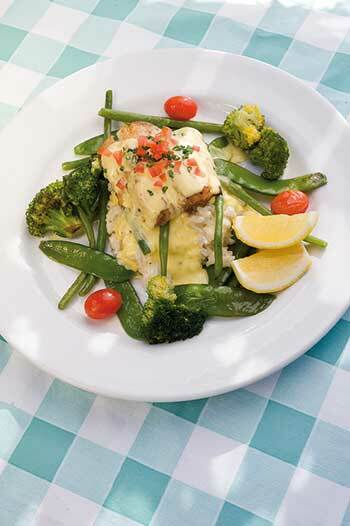 Gently pan-fry the Kingklip for about two minutes a side, then place in a preheated oven at 180ºC for seven minutes. Blanch the vegetables in boiling water until al dente. To serve, place a spoonful of the rice in the centre of each plate, surround it with the vegetables and top with the fish. Season according to taste, pour over a generous amount of Hollandaise and serve with the lemon wedges.